I get asked a lot, how do you come up with your outfits, who’s your style inspiration, why do you dress in a certain way and I must admit, I do find it hard to come up with good answers to each of those questions. So I thought I would share how I basically found my mojo and slowly found my own sense of style. It really all did start with experimenting and trying out things to see what I actually really liked. Sometimes, I see clothes on other people and I admire the way they style it or like certain things and I just think, “oh why not try that?” I remember trying out the way that other bloggers put themselves together and I would just think…”This doesn’t suit me,” ” Why do I look weird?” “I don’t feel comfortable in this…” and the list goes on; so over time I kinda figured out what I liked and what really resembled my personality instead of copying everyone else’s style. I mean yes, I still use Instagram and other bloggers as inspiration, but If I do decide to wear something, I like to make sure that I add my own little flare here and there so that it 100% represents who I am. I get asked a lot, how would you describe your style… In short, my style represents my chaotic, fun and daring personality. Because of my extroverted personality, I just loveeeee colours, everything about colours drives meee crazy 😉 . I think because I love trying new things and being adventures and I try to bring that out with my sense of style. 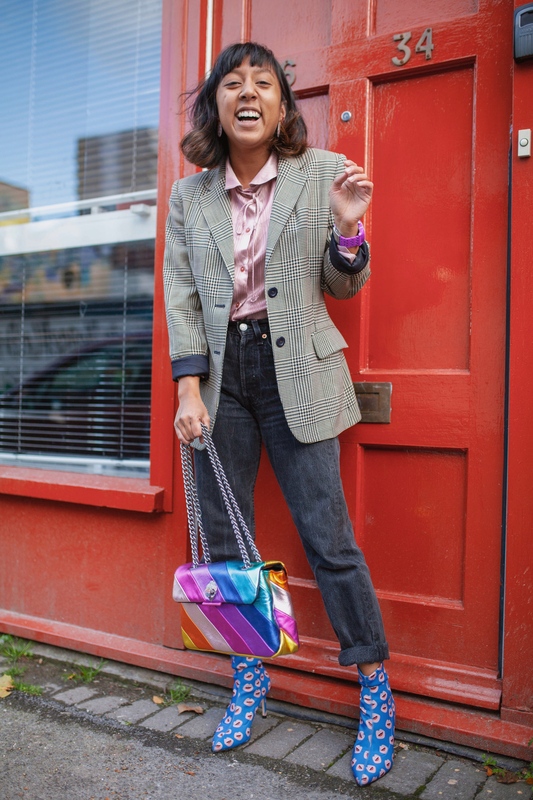 I love a good bit of bold colours, clashing prints and everything that you wouldn’t expect to go together. 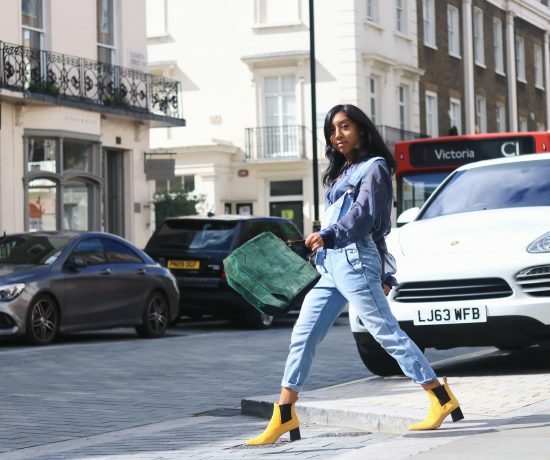 When I scroll through Instagram, I start to realise that there are so many bloggers who wear camel, and monochrome, which don’t get me wrong looks STUNNING! But that just isn’t me, I’m someone who likes to be a little different. I was definitely never a sheep and I always did things on my own accord. So if someone tells me that what I’m wearing is a little out there and weird, then perfect, I’m a little out there and weird and I’m definitely not afraid to be different. 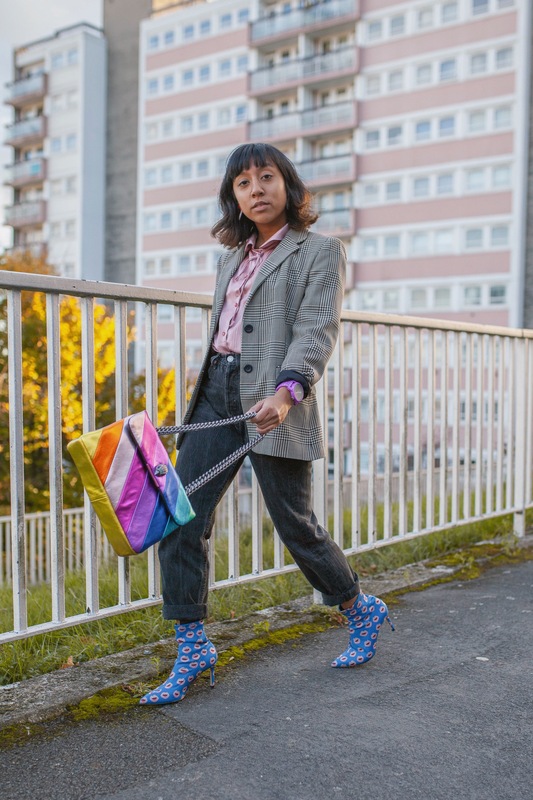 I’m going to be sooo honest, when it comes to creating outfits for the blog, I don’t spend hours thinking about what to wear, I kinda just throw on what I think might go together, accessorise with items that are a little out there (in this case my fav rainbow bag and the lip boots) and head out the door. On a daily basis, I would wear this outfit yes (okay minus the shoes because I can’t walk for long distances in heels lol,) I honestly don’t think there’s any point in creating an outfit that you actually will wear on a daily, because what’s the point on sharing your outfit inspo if you don’t even wearing that thing on a daily? I know that earlier I said that I wouldn’t wear these shoes on a daily, well of course I wouldn’t ! I can’t be seen wearing stilettos in the lab that I spend eight hours a day in… that would just be in-practical and unsafe, so it wouldn’t be a good idea hahaha. But if I was going out for lunch or dinner then yesss I would wear these shoes because they’re so cute ! Maybe not the comfiest but definitely something I would wear… So you don’t need to worry about that ‘;) . On that same note, yes outfits have to be something that you’d actually wear. That also means that you have buy the clothes you wear from shops and places that you actually like! No point in going to Zara and buying stuff just because everyone else is too… As a student, we all know that the finances can be a bit of a problem. So it’s SUPER rare that I ever buy something full price or even in store…. Most of the time…I buy things off eBay, Depop and charity shops because, 1) I can find things that no one else has and that is fun 2) they’re always so much cheaper and better value for money… So what’s not to like?! So what about this outfit? 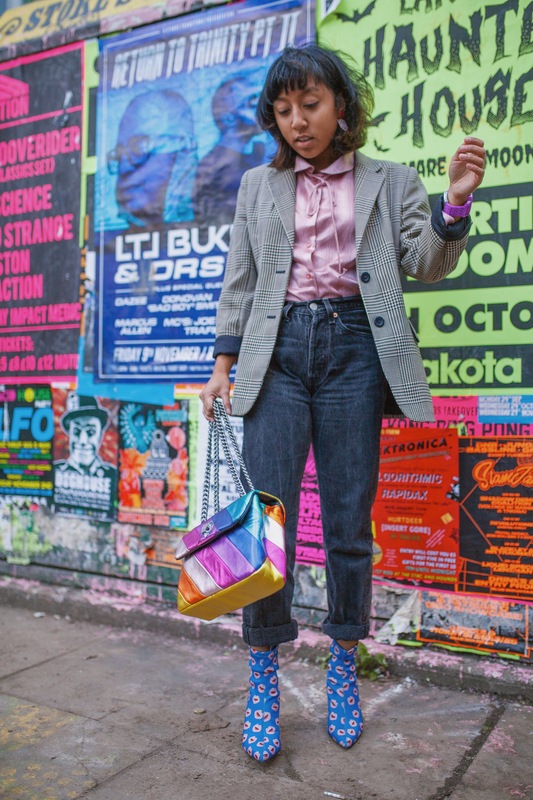 Whenever it comes to coming up with new outfits there seems to be a theme that I seem to run by, and that is I seem to like mixing classic with the funky. That doesn’t really make sense lol, but basically I always wear classic kind of pieces with something a little more “edgy” and different. 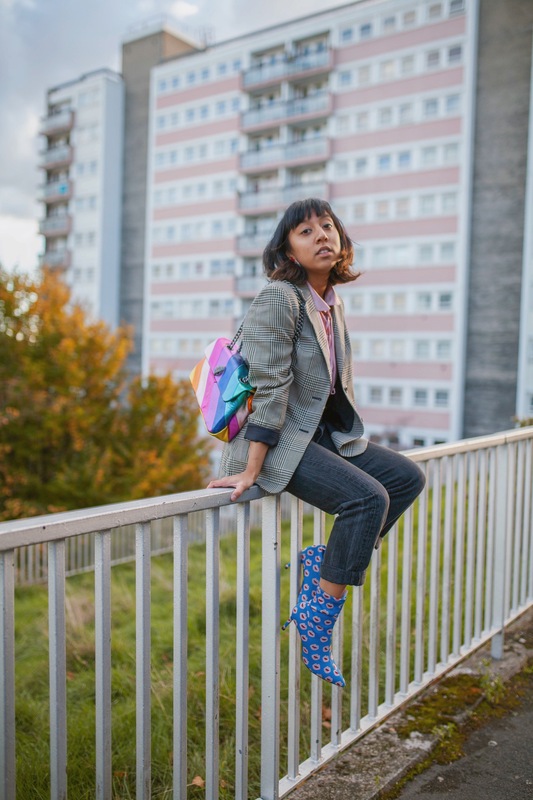 So for example, with this outfit, I’m wearing a gorgeous baby pink blouse and I’ve paired it with a checked blazer. Both of these items are vintage and I got them in charity shops 😉 . I just love anything classic because I think it just adds some class to any outfit and they never go out of style, which means that you can always trust that they’re going to be a keeper ! 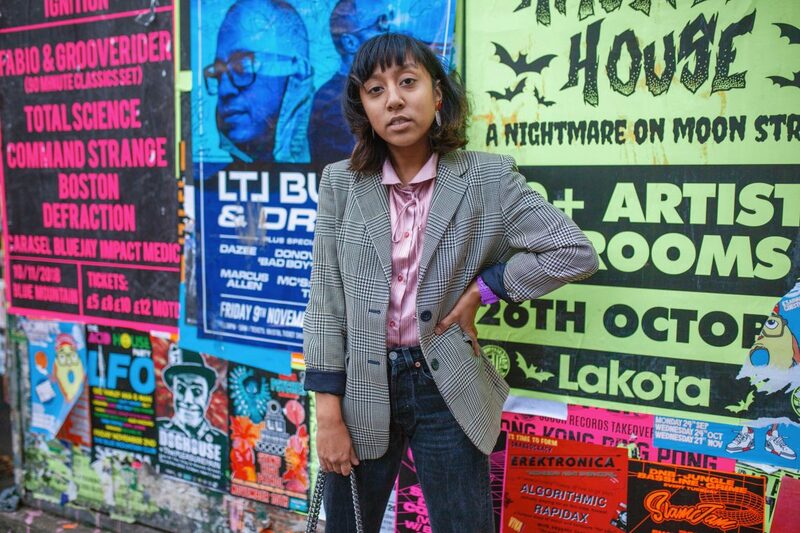 😉 I decided to wear the blouse and blazer with another vintage item, my trusty Levi 501’s because they go with everything and they’re just so comfy! They’re definitely the pair of jeans that’s going to stay in my wardrobe until the have holes in. Black is also such a sturdy and easy colour to style. Monochrome is always so causal especially when it comes to jeans, which means that it always makes any outfit look a bit more chill than it might already do. 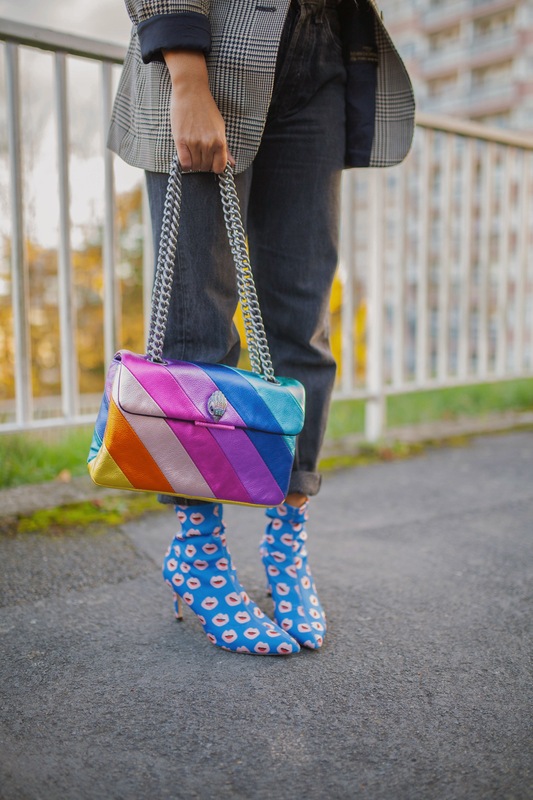 Black jeans= wardrobe staple so you just can’t go wrong 😉 Finally, to add a little Izzy flare I’m wearing my all time fav metallic rainbow bag (which I probably wear too much whops 😉 ) and my new lip boot socks. Aren’t these shoes just so fab ?! They’re so fun and different I just couldn’t say no… I think a lot of people would expect them to be hard to style but I think they’re the kind of shoe that despite being different 100% has the potential to go with most outfits, especially if you want to make a statement ! 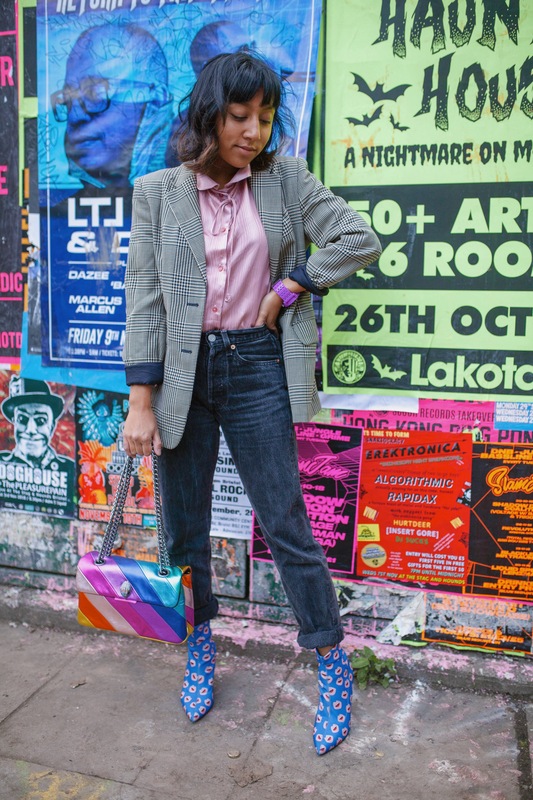 So I must admit, I don’t really know what point I’m trying to make in this blog post… I guess I’m just trying to explain how I ended up with the style I have and how I put my outfits together. I feel like people go through phases when it comes to their outfits until they finally feel like they’ve found their mojo. Am I right? Hahahaha. I hope you liked this blog post ! Who knows, maybe it gave you an insight into how you can refine your style to make it yours!